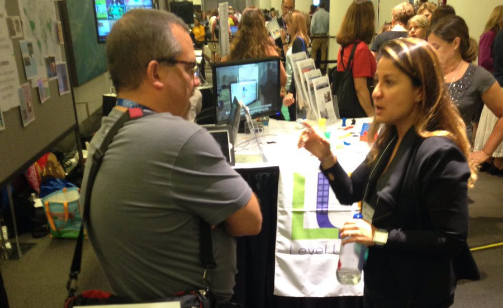 Teacher Esra Muray shared her experience teaching Level Up Village courses in the Global Learning Playground at ISTE 2016. “We need to undergo a revolution in how we view education” because “we don’t live in 1950 anymore,” urged theoretical physicist, bestselling author and futurist Michio Kaku in his opening keynote of ISTE 2016, the premier education technology conference, held in Denver, Colorado, this June. The emphasis on and the struggle in transforming education is real. Blended and personalized learning for all learners is here. Not only that, today’s students are transitioning from consumers of technology to producers of technology. And augmented reality is on its way in. 1. We must reshape our understanding of today’s learners. As educators, districts, and leaders of edtech companies, we must configure and adopt a shared definition the “digital age learner” and what that means in the way we teach students or provide services and/or products. The newly revised and released 2016 ISTE Standards for Students, gives a true reflection of what a learner should be doing today – not tomorrow. More than 3,000 educators, teachers and learners, as well as 295 students, helped shape these standards. In their panel, Los Angeles Unified School District described how they convened an Instructional Technology Initiative Task Force in April 2015 to develop a strategic plan to address the major shifts in education and create a shared vision for instructional technology. They were the first district to adopt and unpack the new standards to gain a true understanding of their learners. We can start by reading and sharing these standards with our teams and administrators, and then propose to create an action plan to integrate into our existing curriculum. 2. Global Connectedness should be part of every classroom. It is no surprise that one of the newly revised ISTE Standards for Students is to be “Global Collaborators.” This standard asks students to strive to “broaden perspective, understand others and work effectively in teams using digital tools.” Whether it is in “micro-writing,” a newly-coined term for writing in little bits in social media, or in understanding the future of our food, global connectedness is truly the pathway to create, share, and leverage the power of our social networks to become global citizens. As a presenter in the Global Learning Playground this year at ISTE, the emphasis, the implications, and the future of global connectedness also speaks very closely to my heart. When other educators ask me how to jump-start, I suggest them to pick one area/topic/project, and one tool (Skype, Twitter, email,…) to link learners globally, and track the impact of the connection.You can also reach out to organizations like LevelUp Village, whose after school programs I have taught, for support in the process of getting globally connected – their expertise not only helps educators bring the world right into their classroom, but also brings high-quality professional development to the educator in areas like STEAM and design thinking through collaborative, real-life problem solving on a global scale. 3. Foster Computational Thinking among all learners. The idea that we are all interconnected is not novel. It brings to mind the late Donella Meadow’s 2008 book, Thinking in Systems, in which she urged us to develop system-thinking skills in ourselves and in our learners to become leaders in the digital world. Similarly, the newly-revived thinking around “computational thinking” calls for raising learners who can identify authentic issues, gather and use data, and find innovative solutions. This theme emerged across several areas at ISTE2016: the newly-revised ISTE Standards for Students, coding as part of the curriculum, gamifying instruction with tools like Minecraft, and designing collaborative learning spaces to foster problem-solving skills. Computational thinking also integrates several current best practices such as teaching the principles of design thinking and the engineering design cycle by incorporating them not only into our curriculum, but also in our pedagogy. This is a major shift with great implications. Any teacher can start by using the free online resources, such as the lesson plans from code.org, to begin familiarizing learners with the principles of computational thinking. For inspiration, follow leaders like the Oakland Unified School District, which has made the pledge to ensure all of its students, Pre-K to 12, have access to computer science education in and outside of the classrooms. Social equity was also the topic of an EdTekTalk by the mother-daughter power duo, Marley Dias and Dr. Janice Johnson Dias. Marley is an 11-year-old who got tired of reading books with “white boys and their dogs” as characters, so she, along with her mother, founded “GrassROOTS Community Foundation” to unearth books with main characters with whom she can relate. Just search the hashtag #1000BlackGirlBooks and you will see how she leveraged technology in an innovative, meaningful and impactful way. Phenomenal stories to share with learners. 5. Encourage learners to tell their stories. Fireside-chats with your grandparents are alive, but in a new form. As an educator, you probably tell your story through a blog, Twitter or Facebook. Now it’s time to turn the tables around. In his ISTE2016 session, Jason Ohler from University of Alaska, asked educators to shake it up a little bit and really focus on what we think matters in our students’ lives. Storytelling, one of his “Five Trends that Bend,” is a powerful way to not only engage our students, but also build the bridge between critical thinking and creative thinking. In today’s storytelling, students have access to multiple platforms and formats using the available digital tools. Along the lines of encouraging our students to tell their narrative, George Couros, author of Innovator’s Mindset, asked us to allow our students “practice empathy, not superiority” via their participation in social media platforms. “The world is at your fingertips,” Couros said in his session. “What are you going to do with it?” These are the kinds of questions we need to continuously ask ourselves, to not only engage our students in taking charge of their own learning, but also prepare them for tomorrow. So, with so many new ideas, technologies and digital tools to choose from, the big idea educators should focus on for the 2016-17 school year is that today’s learner profile is vastly different than yesterday’s. The revolution in education is upon us. We owe it to our learners to empower them in their own journey to become lifelong learners..
Esra Murray: Esra Murray is a Global Ed Believer, EdTech Enthusiast, Level Up Village Instructor and Teacher at ISD, an International Baccalaureate school in Greenwich, CT.